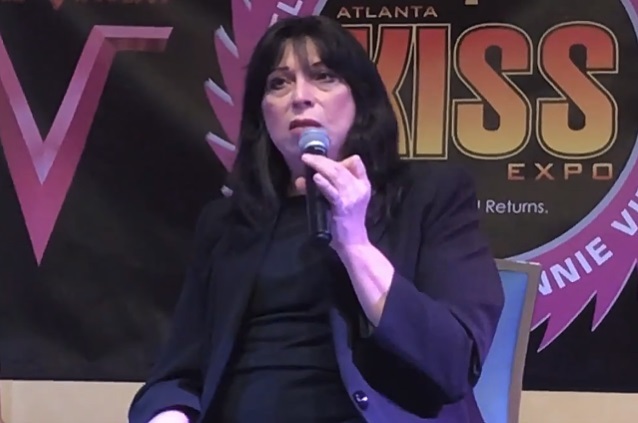 Earlier today (Friday, January 19) at the Atlanta KISS Expo 2018, former KISS guitarist Vinnie Vincent gave his first public interview in more than two decades when he spoke with SiriusXM's Eddie Trunk. A few excerpts follow (as transcribed by BLABBERMOUTH.NET). "My life became small. I wanted to become as small as I could be. I became very happy, very content. All I do is I play, I write, I record, I take care of my dogs. I have a really private, peaceful life now, and I haven't had that in a long time. A lot of fans know a lot of things, but they also don't know a lot of things." Vinnie: "When it's ready to be told, you don't want to miss it. We've had two book publishers. We're talking to them right now. It's a hell of a book. You wouldn't want to miss it. I read Kitty Kelley's unauthorized biography of Frank Sinatra, and I'm not a reader, but I couldn't put that book down. This will top that book." Vinnie: "I spent 20 years in hell. The broad strokes were very... they could have been not so broad. They could have been quickly and really amicably could have eliminated 20 years of pain. I would say pertaining to KISS, these are my friends. These are guys I love. I love them to this day. I've got tremendous memories that are wonderful. Most of them are. Not always can you have a band and have a certain... I hate this word 'magic,' but it is a magic. It's something you can't put into words. THE BEATLES had that. THE WHO have it. [LED] ZEPPELIN had it. I always looked for that, and I never found it until I met them. It was something that, 'This is the glue. This is the ingredients that I never found.' It was everything you put into a mix that blows up. Good and bad. Vinnie: "All good. I was a newcomer, so I appreciate that advice. It was a time of being a guitarist, and that's what I wanted to be. That was my time. But working in context of what the band was, I'd say that I give them credit for knowing more than me. Vinnie: "It was contractual. All of the problems we had were contractual. All I had asked for was to be treated fair — not much more than that. Publishing is like owning your house, owning your car. If you don't own it, you're leasing it, you're renting it. Then there's people that think that if they sit in your car, you're taking them for a drive, at some point, they'll turn around and say, I want your pink slip. It's down to ownership of your property. It's really simple. It's not more difficult than that. The people who say that's not important are usually the ones who want your property." Vinnie: "I play about seven hours a day. I take care of my dogs. I write; I record; I do everything I've always done. I'm just not out in the public doing it." Vinnie: "I think if they want me back, I'll be back. I'm here. I've only left because the world has changed. People, the Internet have changed. People have gotten very mean. I just don't feel that anymore — I just want to have people leave and saying, 'I had such a great time. It was really nice.' This gives me a chance to finally leave the past behind, whatever was bad, and look forward to seeing whatever is there. "Strange of all things, Probably the nicest thing that's happened is I heard from one of my old friends, Gene [Simmons]. I love Gene. In the early days, he treated me so supportive. Remember, where KISS was at in the days was, 'Here comes this kid.' I wanted to rule the world, and they have already ruled the world. I came and wanted to be as much help to this band as I could and bring whatever I could to them. I'm here to be whatever I can for this band. And I did feel with all my heart that this was everything I've ever wanted. There was nothing I wanted more than that in my life — nothing. They had a choice. There was people all over the world that would have done anything, and so I would have too. Something happened when we began to write songs together, and for whatever unhappiness there was, I think it was meant to be. I think everything that happened was very special, and I think the fans know it. I think it was a great chapter in the band's career. "I have an e-mail address that I hadn't checked in about five years. It was an e-mail I only used for certain things that were going on business-wise, and once that business was done, I never checked it anymore. I don't know what caused me to do this — forces sometimes, they compel you to do something, you don't know why — Christmas night, I said, 'I better check this e-mail, just to see if it's still there.' I see three e-mails from Gene. I say, 'Isn't that great? How nice. I wonder what I did wrong now. [Laughs] I wonder what he's yelling me at for now.' I'm looking at the dates of these e-mails, and they're from June and July. This is Christmas night. I opened it up and it had to do with [Simmons's recently released box set] 'The Vault'. We had written a lot of songs during the 'Revenge' era, and I think there's one on there — one of my favorite songs, my own personal favorite songs, 'I Wanna Live'. This was June; he sent me another one two weeks later and gets no answer from me. Then he sends me another one in July, and there's no answer from Vinnie, basically about the same thing. I said, I bet that's why he's mad at me. I read all three e-mails, and I said [imitates typing], 'I love you; I miss you; come on home,' you know? Then we started emailing again. He said, 'I'd like to have 'I Wanna Live' on 'The Vault', and invited me to Nashville and receive it on stage and to meet each other again. I said to him, 'Listen, you said some stuff about me — come on, we're past this.' I said, 'I just want you to know, I still love you. I always will. We had a lot of good things. Let's move on.' The e-mail vibe was great." Vinnie: "Absolutely. I will show up for him." Vinnie: "I feel very strongly about them. The second record should have never happened. Rob [Fleischman] should have stayed with the project. The basic sound of that record was like [Jimmy] Page and [Robert] Plant — it was Rob and me. That first record was pretty red-hot. It was my vision; Rob singing; everything was just right. Second version of it should have been aborted, should have never happened. I had the power; I should have taken it. I should have called the shots, which should have been, 'Stop this. Revamp it. Go back, let me get the people I need.' The people that were involved with it at that time should have not been involved with it, but it was such a publicity machinery piece of... it was like a product. It was all publicity and hype. The songs, I felt were really good, but I didn't feel the music came out to be... the records weren't what I would have done. I would have never settled on records like that. When I say records, the first one, yes; the second one, no; and that singer [Mark Slaughter] was unbearable as far as I'm concerned." Vinnie: "Absolutely. This is what I do. I've not stopped doing this. Publicly, if the fans want me back, I can't wait. This is what I've been waiting for anyway." Vinnie Vincent joined KISS in 1982, replacing Ace Frehley. As the "Ankh Warrior," he toured with the group in support of "Creatures Of The Night", on which he played lead guitar on six songs prior to becoming an official member of the band. From there, KISS wrote and released "Lick It Up" — their first album without makeup — in 1983, a recording on which Vincent co-wrote eight of 10 songs, including the title track, which remains a staple of the group's live performances to this day. Despite the album's success, Vincent was fired by KISS after the "Lick It Up" touring cycle came to an end, allegedly due to a dispute over both the terms of his employment contract with the band and royalties. From there, Vincent founded a new group, VINNIE VINCENT INVASION. The group recorded two albums, a self-titled 1986 release and 1988's "All Systems Go". In 1992, Vincent re-teamed with KISS principals Gene Simmons and Paul Stanley to write three songs for their acclaimed album "Revenge", including the record's first two singles, "Unholy" and "I Just Wanna". Their relationship quickly soured once again, however. Four years later, Vincent released a solo EP, "Euphoria", which featured vocals by former VVI singer Fleischman and included material from sessions recorded around 1990. Soon after that, Vincent vanished from the public eye and remained off the grid for more than two decades. Last year, Vincent was the focus of a Swedish TV documentary called "KISS Och Gitarristen Som Försvann" ("KISS And The Guitarist Who Disappeared") which apparently tried, unsuccessfully, to track Vinnie down and get him to sit down for an interview. Now that we've seen him and heard him speak. The legend that is Vinnie Vincent is alive and well.